You might even dream of owning your own Dyson Vacuum Cleaner, but the cost of the product makes you more likely to buy another. Let me assure you the cost is worth it. My husband bought my vacuum for me for our anniversary in 2004. Most women would be appalled but I really really wanted one. I have now owned the same vacuum now 8 years and it is still working great. 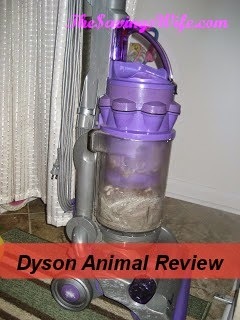 I have even made my own repairs on my Dyson DC14 Animal after the 5 year warranty expired. I had no repairs during the warranty period. I can't recommend a better vacuum. 1. Great Clean. It has kept my floors very clean and gets up all my pet hair and my hair. I can fill the canister full each time I vacuum my house. I like to vacuum 2 or more times a week. It also works well on bare floors. My kids even use it to help clean up after dinner or a breakfast cereal mess. 2. Can't clog it. When you vacuum up something you shouldn't, it is easy to get to what is stuck. Every part of this vacuum comes apart to give you easy access. With the touch of a tab or button you can get to every part. 3. Easy to repair. There are lots and lots of you-tube videos telling you how to repair your Dyson one that shows you how easy things it can be to take the vacuum apart is located here. Repair shops hate these vacuum because they don't make much money off of them. They are really that easy to repair. 4. Wand. Everyone knows that you can't vacuum everywhere with an upright. This vacuum is different. Dyson uprights come with their own wand that opens and closes back within seconds. You simply set the vacuum up push a button and extend the wand. No more turning the vacuum off. My kids can use extend and collapse the wand themselves. 5. No bags or extra expense. The belt hasn't broken and I am happy to report there is no bag to change. Simply press a button off pops the containment canister and then press another button over your trash can and it will empty. 6. The attachments. The vacuum itself has two built in attachments for cleaning your couches. After registering my new Dyson, I had a surprise box of Car care Tools show up at my door. Notice my attachments have fallen off the lid. I just store them with the car care attachments. 7. Long Lasting. I've used mine for 8+ years and it is still going. There is really no reason not to buy a Dyson. Most vacuums will not last as long. You can't fix any other clogged vacuum without costly repairs. Repairs done yourself are not as easy on another vacuums. It really cleans your floors. Update: After 10 years it has finally bit the dust. My kids broke the plug and although I could repair it I really wanted a new one. Just got a new dyson.